Somewhere towards the end of Star Trek: Nemesis, the latest Star Trek big screen to feature the “old” Generation crowd, exhaustion set in. How many times have I seen the crew of the Enterprise reroute the power from the rear deflector shields to the front shields to compensate for power loss during a pitched climactic battle with an archenemy? I don’t know, but ever since The Wrath of Khan back in 1982 moved the movie franchise to more of an action movie premise when Khan and Kirk battled it out in the memorable battle between two star ships at the end, I am sure we have seen this happen quite a few times. At one point, the Starship Enterprise E was even utterly destroyed. “Lots of letters in the alphabet,” I remembered Captain Picard (still ably played by Patrick Stewart) shrug laconically. I think this was in First Contact (1996) – I could be wrong. And I think they did the same exact thing in the next movie, Insurrection (1998). Or am I confusing it with the 1994 Generations? I don’t know anymore. The Trek movies sort of blur into one another. There is the one with the whale (The Voyage Home) which we liked and the one in which they sang campfire songs which we hated (The Final Frontier). In-between we have a lot of clichés unique to the franchise: those shields that never seem to hold! the lack of safety belts! the ceaseless techno babble! 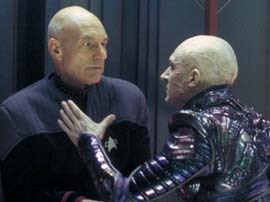 In Nemesis Captain Picard battles it out with an evil clone. I am sure this plot has been done before, probably as far back as the original 1960s TV series. The clone has it in for the Earth (although I couldn’t exactly understand why) and has taken over the evil Romulan Empire after some skullduggery. Don’t get me wrong: this isn’t a bad Trek movie and fans won’t be disappointed. The action is intense, and the special effects are well done. We also get to see what happened to some of the Next Generation crew in the end. Without giving too much away, this would seem to be the last big screen movie to feature the Generation crew. Who knows who will take their place? Maybe the universally despised Voyager crew? I don’t know. Nemesis unfortunately isn’t such a fond farewell. The underrated 1991 The Undiscovered Country saw the Kirk, Spock, et al crew off in more style. Perhaps it is because that movie focused more on character issues than Nemesis, which instead eschews science fiction elements in favor of action. Recommended for Trek fans, those who however suspect that the franchise has exhausted itself, won’t find anything in Nemesis to contradict their beliefs.